Rachel Skatvold: New Release from Kari Trumbo! New Release from Kari Trumbo! I'm excited to announce that the 5th installment of the Whispers in Wyoming Series is now available! This wonderful sweet romance by Kari Trumbo, focusing on redemption and forgiveness will warm your heart and it's just in time for Christmas. You can read the summary for this story below. Also, my book in this series is coming up next! I can't wait to share it with you all on January 12th. Maisey Reynard has lived life with a fiery passion, but all that empty desire is about to catch up with her.Maisey is up for anything fun, so when an old flame from the Broken J Ranch asks for a visit, it seems like a good chance to get away. But when he leaves her stranded with his handsome, charming brother, she's a fish out of water, especially when Brayden isn't falling for her usual charms. Nursing an injury after a rodeo accident, Brayden isn’t ready when feisty Maisey is bucked into his life. She’s beautiful, broken, and everything he could ever want. After just a few days, he's almost got her convinced she can be whole, until a wrench in the form of his mother is thrown into the mix. Brayden must convince Maisey she's got a life worth living...with him. 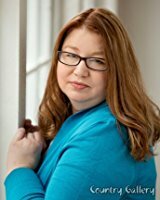 Kari Trumbo is one of four authors in the best-selling Cutter’s Creek series. If you'd like more information about the Whispers in Wyoming Series, you can visit the WIW page on my website or join the Facebook group to keep up on new book releases and have chances to win free books from all the contributing authors! Just click the links below to visit. Hope to see you there.